Through the years, research on reading has made enormous contributions to helping us understand how students learn to read and how teachers can best instruct them. Research continues to add to our fundamental knowledge of reading in significant ways, thus adding more pieces to the puzzle -- for example, finding answers to how students learn content in other school subjects through reading, and what strategies teachers can use to help their students do this more effectively. 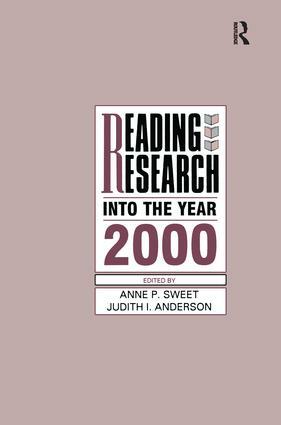 Reading Research into the Year 2000 describes the dynamic process that the Department of Education engages in to plan and execute a reading research agenda. It was written to inform a wide ranging public -- those who will benefit directly or indirectly, from reading research findings, including those who use research applications, as well as those who conduct the research. Moreover, it was written to make public the process of establishing a national R&D Center. Few people outside the Department of Education are aware of the procedures that are undertaken. The editors believe that if more people are "in the know," they will be more likely to participate in the entire process -- from generating research ideas to submitting applications -- and that this greater participation is essential if we are to garner divergent thinking about how to solve critical education research issues. They have made a significant step toward breaking down barriers to full participation, and paved the way for greater involvement of "non-traditional" players in competing for a national R&D Center award. "The information is well organized and easy to comprehend….the ideas, issues, and reading research challenges presented in the book will truly be of interest to a wide-reading public….Sweet and Anderson have produced a book that is insightful and thought provoking, compelling the reader to become involved in the search for answers to complex literacy questions and in the ensuing challenges evoked by knowing what we must do to develop a literate nation. Everyone involved in education or concerned about the improvement of instructional practices will find this book informative and inspiring." Contents: M. Goldberg, Foreword. A.P. Sweet, J.I. Anderson, Introduction. A.P. Sweet, J.I. Anderson, Making It Happen: Setting the Federal Research Agenda. R.C. Anderson, The Future of Reading Research. E. Sulzby, Literacy's Future for All Our Children: Where Is Research in Reading Comprehension Leading Us? I.L. Beck, On Reading: A Survey of Recent and Proposals for the Future. J.N. Monahan, Research and Practice: A Practitioner's View. S.I. Scroggins, A Reading Agenda for At-Risk Students: The Practitioner Speaks Out. P.B. Mosenthal, Understanding Agenda Setting in Reading Research. D.E. Alvermann, J.T. Guthrie, The National Reading Research Center.